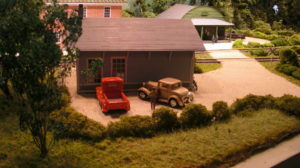 This railroad and modelling job was undertaken for and is on display in the Quarry Gardens located in Schuyler Virginia. 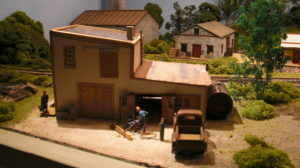 It consists of two diorama type ‘shadow boxes’ through which a train passes, one depicting the town of Esmont and one depicting the soapstone quarry and processing facilities in Schuyler (pronounced ‘sky-lure’). The Nelson and Albemarle Railway/Railroad was a real railroad whose primary purpose was to haul raw soapstone from quarries to the processing plant, move the finished product to the main C&O line for distribution, and carry workers to and from the plant. 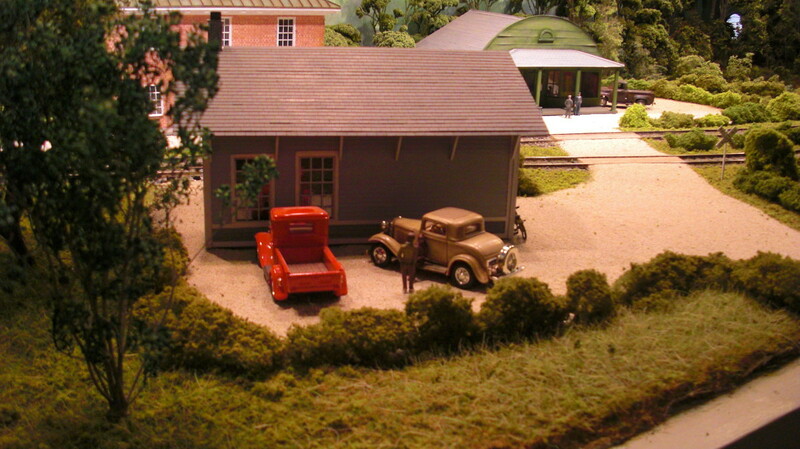 It also moved agricultural and industrial products into, out of, and around the area before being abandoned and torn up in the 1950s. This job came to us indirectly in that we were originally asked to build some of the structures, then all of the structures, then some of the scenery, then eventually all of the scenery.It was also changed from 4 small scenes to 2 large ones. 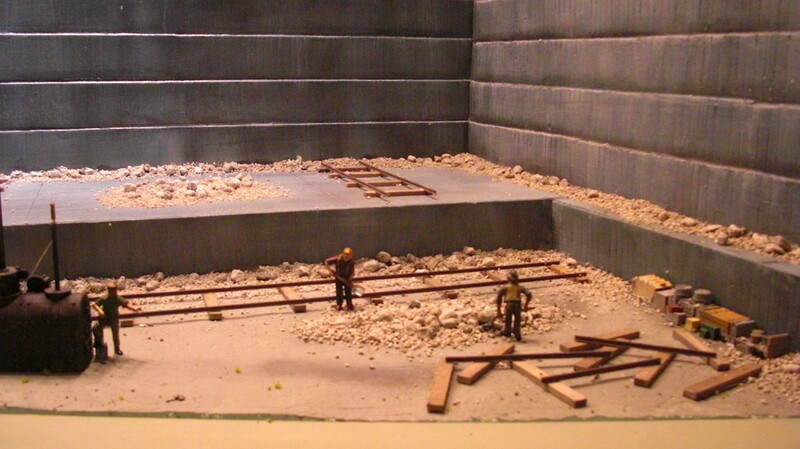 Technically, this was our most challenging scenery and modelling job. 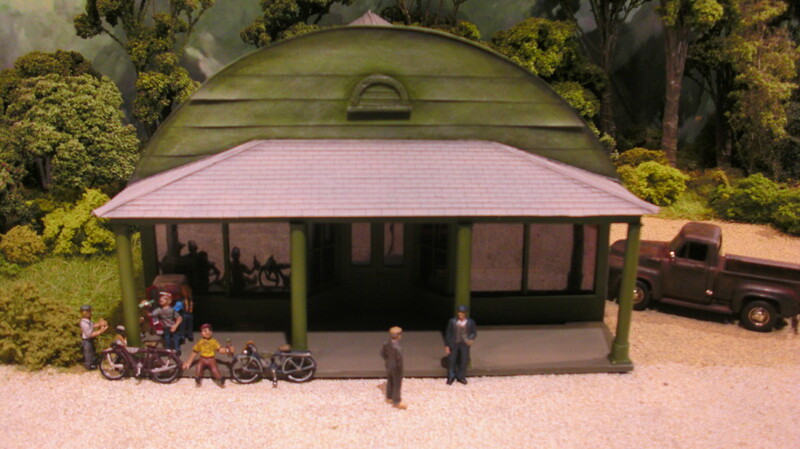 Not only did we have to model specific buildings (in O scale!) but we had to create ways of showing soapstone in the quarry, in large slabs, and in broken pieces used for building construction. For those of you you have never seen soapstone, it is a very unique material with a very unique ‘smooth’ and ‘silky’ look to it. 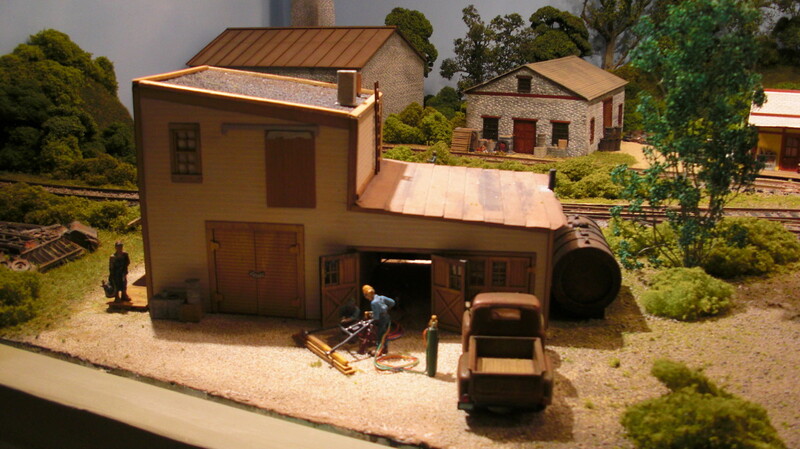 The store is scratch built from sheet styrene with a Tichy door. The shingles and tar paper is from Laser Art. 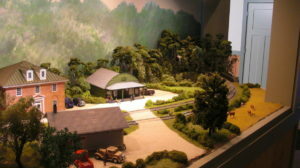 There is an interior scene. 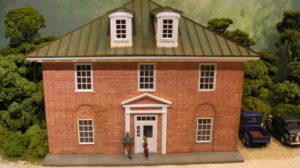 The bank is scratch built from styrene with Grandt Line windows and Busch brick sheeting. In real life, it is now a post office. The station is a heavily modified Laser Art kit. We had to change two walls completely and add roof brackets and details. This crane then hauled the huge blocks up and placed them on a flatcar for transport. 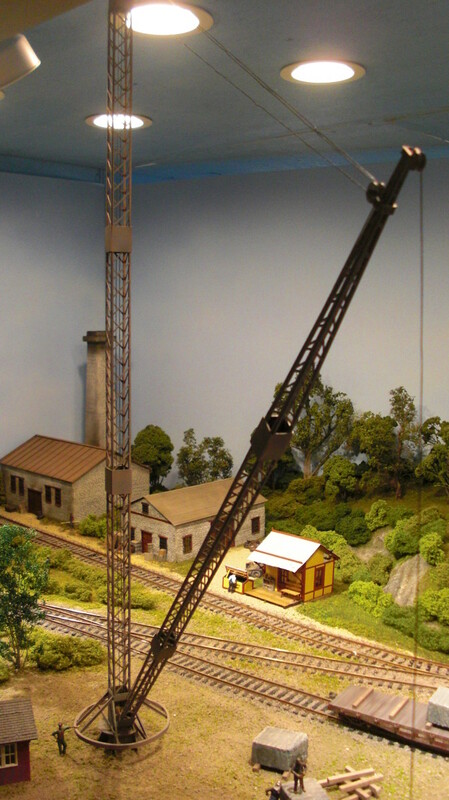 This crane is entirely scratch built except that our good friends at Cardboard Safari cut the frames out of paper. Yes this structure which stands nearly 36″ high is made mostly out of paper! We built it to fit exactly between the ground and ceiling. The soapstone blocks are unloaded from the siding by the traveling crane and then stored between the working structures. To the left is the saw building where the rough blocks are cut to size and to the right is the finishing building where they slabs are turned into countertops, sinks, insulation boxes, and fireplace components, among other things. The scraps are then used locally for structures. 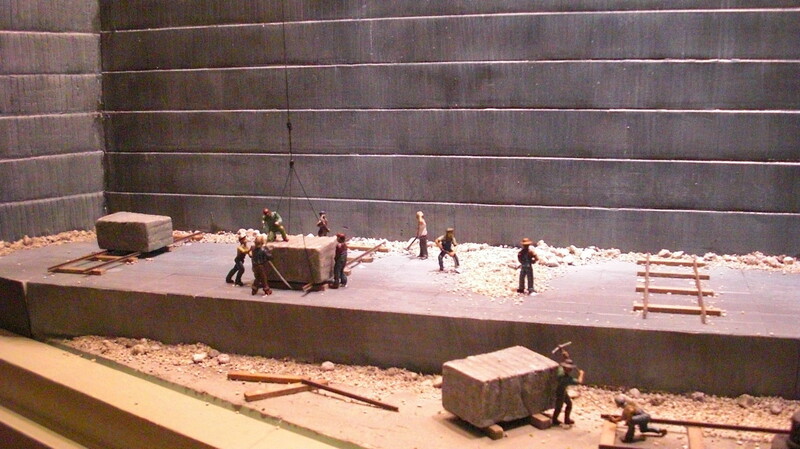 The finishing building is made of soapstone in real life. 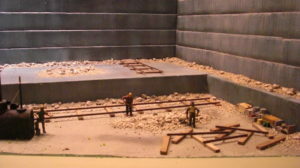 The work area and quarry itself were both packed with simple wooden work structures like this one. 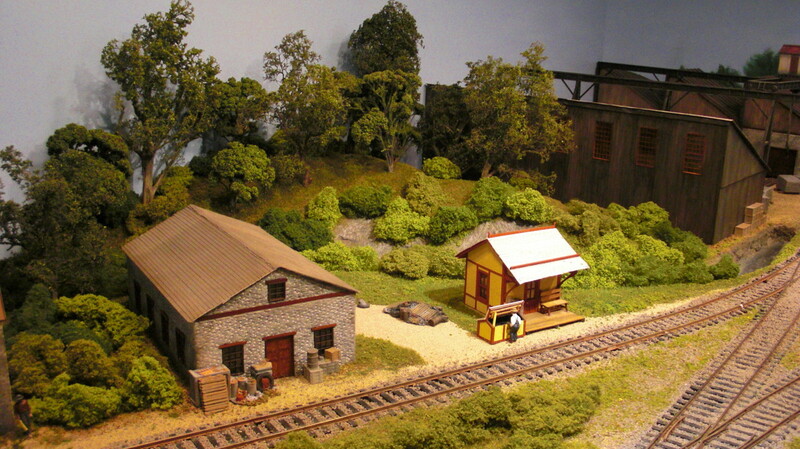 This is a kit from Laser Art, one of two kits we were able to use ‘as-is’ on the layout. The truck is a die cast piece we weathered a lot. 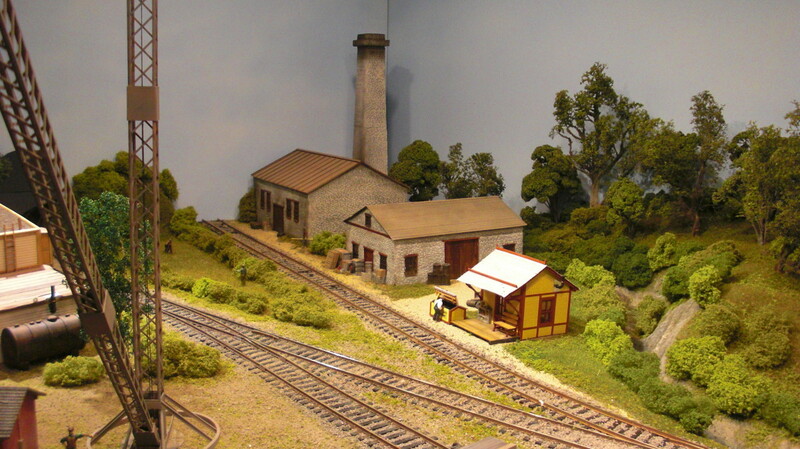 The left building is the power station for the complex. 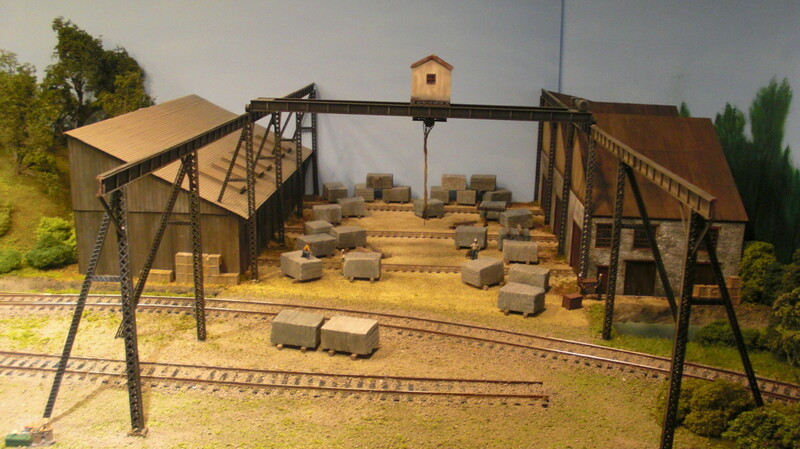 Another scratch built soapstone structure. In real life it on the nearside of the tracks but that just didn’t work with the space we had. Note the junk pile in the foreground: the actual site had junk piled everywhere. The folks in the background are surveyors: the quarry was expanded several times and things moved around to accommodate. 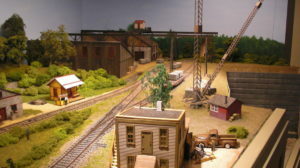 This view shows the quarry, crane, and general layout with the background painting. The backdrops are painted sign grade plastic. They are removable for access. 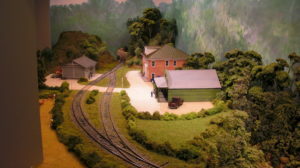 This view shows the stream (running behind the buildings). 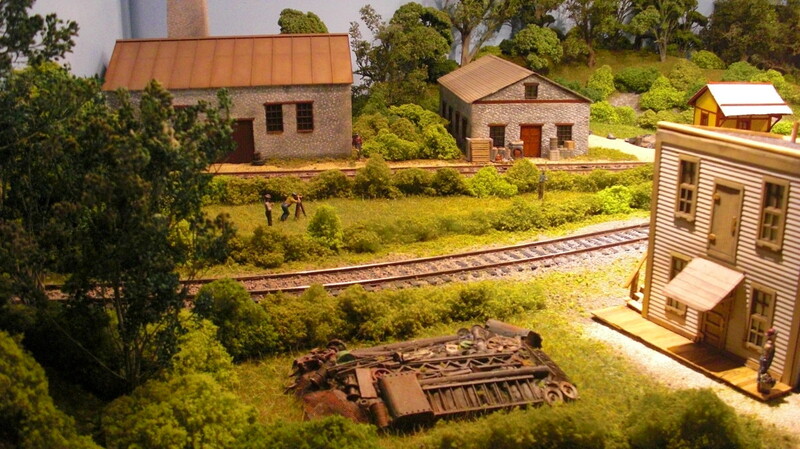 Hurricane Camile in 1969 raised this steam into a course that flowed more than 5 feet above the tracks! This destroyed most of the wooden structures but the ones made of soapstone are still there today. Others were rebuilt with steel and the facility continued to operate until recently. This project was amazing to work on. Go visit the Quarry Gardens and see it in person.